By default, all images of an image sequence are stored in the same file. However, some formats (e.g. JPEG) do not support more than one image. In this case, or if single is selected, each image in a sequence is stored in a separate image file. Select tiled to create a composite image by combining several separate images. The images are tiled on the composite image with the name of the image optionally appearing just below the individual tile. Append appends all the images in a sequence. All the images must have the same width or height. Images of the same width are stacked top-to-bottom. Images of the same height are stacked left-to-right. If the stack parameter from Miscellaneous Options is set, rectangular images are stacked left-to-right otherwise top-to-bottom. Preview applies an enhancement (specified as an optional attribute) 8 times at different factors to the image. This is useful for determining which enhancement factor is best suited for a particular image. Histogram produces a color histogram of your image. 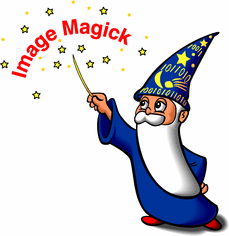 Use clipboard to paste the image to the ImageMagick Studio clipboard.